If you are a busy young mom and think you don’t have time for baking during this busy holiday season, you may want to rethink this time-honored tradition. Why? Because I can barely remember the gifts given me over the years by my own mother and grandmother, but I will never forget the gift of the many Saturday afternoons we spent together gathered around the kitchen table on gloomy December Saturdays chopping, mixing, and rolling. And laughing. And talking. My family has a long-standing tradition of baking for the holidays and, although I didn’t understand it then, baking with my loved ones left me with a heart full of fond memories and happy times that can still make me laugh out loud or shed a tear. This past Saturday as I went about baking my own holiday treats, the kitchen was silent (but still gloomy) and I had no one to help chop the nuts, dates, or cherries or to share a laugh with. But as I read over food-stained and dog-eared recipes on yellowed index cards, many written in my grandmother’s or mother’s hand, I could feel their youth, energy, and presence with me. I thought of the tins full of baked goodies stored in my grandmother’s basement or on her enclosed front porch, the fruit of our labor done and in waiting for just the right moment to celebrate. I thought of the years when my grandmother cleverly hid dozens of tins from all the men and children in the family. These were treats to be savored, not scarfed up by a bunch of 10-year-olds and husbands with a sweet tooth on a Friday night. 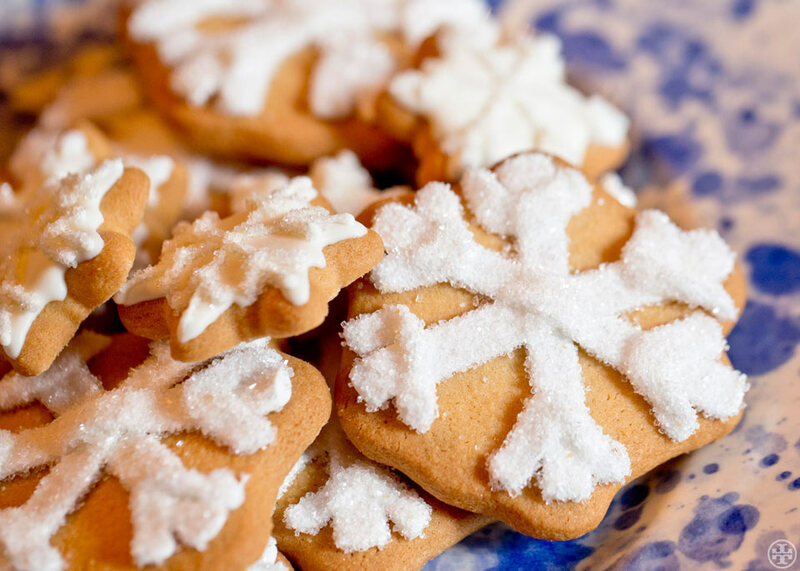 No, the dozens of cookies we labored over were meant only to be pulled out and artfully arranged on plates lined with paper doilies and shared when friends and neighbors dropped by. And drop by they did. On Christmas Eve and Christmas Day, there were tables lined with tempting baked treats for the many old friends and distant relatives who stopped in. “Have some cookies,” the ladies would all sing in unison as the next wave of visitors crossed the threshold. As I baked in silence this season, I thought of my first apartment, my childhood home, and the time when my mother visited me when I lived in Hagerstown and we shared some forbidden (it wasn’t time to celebrate yet) cherry wink cookies and coffee after I put my kids to bed . It is funny what you remember, but I can recall how cold it was that day. It was clear and bright with hawks floating on the thermals and the wind nearly rippling the curtains in my kitchen as it whipped through the Cumberland Valley and slammed into the back of our poorly insulated rancher. My first home and the one I tucked my adorable toddlers into bed in every night after reading them books and fetching them multiple glasses of water. And my treasured weekend with my mother. It was also the same type of blustery, cold clear day in February nearly three years ago that I said my last good-bye to her. As she lay silent in her bed unable to speak, I talked to her for hours, recalling the fun times we had all shared, speaking of shared moments in time with her that were not holidays but that left lasting impressions nonetheless. I recalled the winter we all sledded into the night with a bevy of neighbors, drinking hot chocolate and, of course, eating leftover Christmas cookies. A time when my mother was young and fun and death was a million miles away. I cried all the way from the elevator doors of the hospital to the parking deck that blustery February day, the cold air stinging my tears as they slid down my cheeks. I looked up into the sky and there were the hawks, soaring high in the sky riding the thermals like so many water skiers and like so many blustery winter days long ago. I don’t remember the expensive gifts given me over the years. I don’t remember each decoration on my tree, but I do remember those special times with my mother and my grandmother, simply baking in their kitchens. I surprised myself this year, when for the first time recalling these happy memories, I didn’t shed a tear. Perhaps it is because we learn to accept the absence. Perhaps it is because we are a resilient people and we stoically move forward despite the ache our missing loved ones leave us. Perhaps it is just because I know that my daughter lives just around the corner and, although she is too busy to bake right now with two babies, they will grow. And I can’t wake to bake with them all.